Rhode Island may be a small state but we have a very strong identity and a distinct and enthusiastic food culture. A Taste of Rhode Island is a new documentary series about Rhode Island's dynamic and diverse food and restaurant scene. Rhode Island PBS airs the first two episodes back to back on Friday, July 6 at 8 and 8:30 p.m.
Rhode Island’s access to some of the best seafood and shellfish in the world and a thriving farming culture blends with strong cultural influences. Flavors from our Italian, French, Portuguese, Irish, and English heritage meet a host of new flavors from Latin America, Asia, and African influences, to make Rhode Island one incredibly diverse and delicious food mecca. 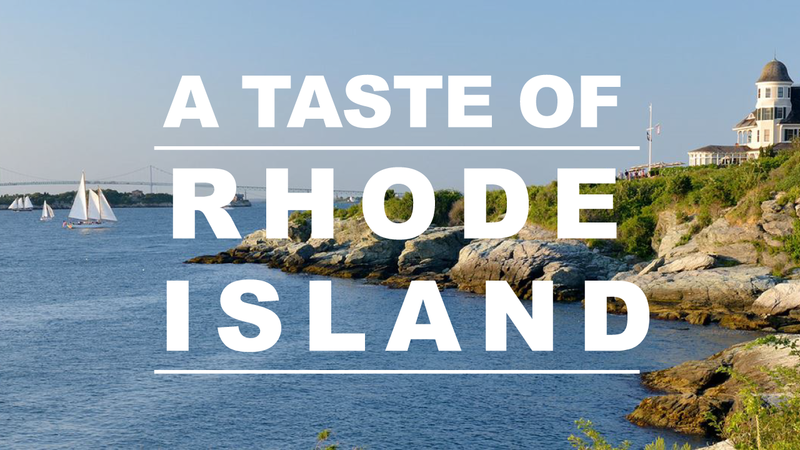 A Taste of Rhode Island celebrates the people and flavors that make Rhode Island one of America's most exciting culinary destinations. Each episode explores a different region, native cuisine, or theme, and will include stories about chefs, farmers, fishermen, and other regional culinary leaders. Shot in high definition with a contemporary, upbeat style, A Taste of Rhode Island also explores how this thriving industry is bringing significant economic, cultural, and environmental benefits to southern New England. The series is hosted and produced by the husband-and-wife team of J.R. and Ali Richards, "The Food Travelers," who have been creating award-winning original documentary television and film about food and travel for more than fifteen years. A city of natural and architectural beauty, Newport is home to both the ultra-rich and blue collar laborers. It also hosts a large, diverse transient summer population of vacationers and sailing enthusiasts. The DeQuattro Family are redefining authentic Italian with their two award-winning Federal Hill Restaurants: Pane e Vino and Massimo. Join us in the kitchen for some fantastic Italian cooking and learn more about modern, regional Italian food. Head into the kitchens of two iconic Newport restaurants that are creating some of the most classic - yet sophisticated - food in a city known for fine food: The White Horse Tavern and Bouchard Inn and Restaurant. Downcity is the historic downtown heart of Providence, and is where you'll find the richest concentration of arts and culture in the city. It's also where you'll find two of the city's most celebrated restaurants: Hotel Providence's Rosmarin, and The Dean Hotel's North. Both serve exquisitely crafted cuisine entirely from Rhode Island ingredients. We delve into the story of Rhode Island's busiest fishing port and taste some of the best seafood in New England. Come aboard a fishing boat and sample the bounty of George's of Galilee and Champlin's Seafood. J.R. and Ali Richards operate Wander Media, an independent production company specializing in documentary stories about food and travel. Their work includes the television series The Wine Travelers (2005) which aired on Life TV in the UK and Western Europe; the culinary lifestyle series Back of the House with Charles Mereday (2014) which aired on Fox 4 in the Ft. Myers/Bonita/Naples region; the critically acclaimed documentary film Beer Hunter: The Movie (2013), about the legendary beer and whisky author, Michael Jackson, which has screened at film festivals and theaters around the globe; and a current documentary in production called Whisk(e)y Chasing, about the global whiskey and distilling renaissance. Both J.R. and Ali are long time veterans of the restaurant industry, both in New England and in Colorado. Ali spent many summers working at some of the best restaurants in Newport, and her longtime friendships with Rhode Island chefs and restaurateurs is the inspiration for this series. J.R. and Ali currently reside in Charlestown, Rhode Island.